Click here to sign up for Library volunteer shifts in March. Click here to sign up for Library volunteer shifts in April. Great link for AR questions and info! One or two kindergarten classes go in the morning slots each day; otherwise, Monday is 5th grade, Tuesday is 4th, Wednesday 3rd, Thursday 2nd, and Friday 1st. A class will have either a library lesson AND checkout, or just a checkout alternating weeks. In the time slots with two classes, one class has both a lesson and checkout; the other has checkout only. Then next week they switch. 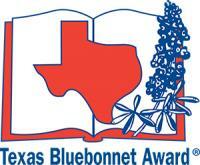 The Texas Bluebonnet Award Master List is considered one of the most prestigious children’s literature lists in the country. Every year, over 100,000 children in grades 3-6 vote on their favorite book from a list of 20 titles curated by librarians around the state serving on Texas Library Association’s TBA Committee. Students in grades 3 through 6 across the State of Texas will vote for their favorite Texas Bluebonnet Award nominated book in January. To be eligible to vote, each student voter must have read at least 5 of the nominated books.